There's something that statistics just can't capture about the entrepreneurial spirit of a town. In some cities, the do-it-yourself business ethic may spring from a ruined economy. In others, small-business booms were carefully engineered by long-term government policies, or developed as a byproduct of rapid growth. Whatever the case, you'll know it when you step into an entrepreneurial city: There's an openness and energy that permeates the whole culture, an infectious enthusiasm throughout the small-business community, and a faith that any problem can be overcome through dedication and smart decisions. Here are 10 cities we think embody the entrepreneurial spirit--and some of the entrepreneurs that power them to greatness. There may be no place hit harder by the mortgage meltdown than Sin City: After decades of breakneck growth, home prices have slumped 35 percent to 45 percent, unemployment is near 10 percent and the tourism industry is struggling to fill rooms. Those might be the best reasons to set up shop in Las Vegas. With commercial rents, cost of living and employee wages as low as they've ever been in modern memory, small businesses have a chance to do the cash-intensive phase of business development at discount rates. "The slowing economy has provided opportunities," says Kara Kelley, president and CEO of the Las Vegas Chamber of Commerce. "Housing is more affordable than it has been in eight years. Smart business owners can take advantage of that." And when the economy does rev up? They'll be basking in the sunshine. Cupcakes, it turns out, are recession-proof. 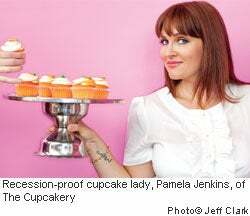 Or at least the Kir Royale, Chocolate Peanut Butter and other gourmet flavors sold at Pamela Jenkins' The Cupcakery are. The New York transplant, who runs two Cupcakerys in Las Vegas and opened two more in Texas, is preparing to start up a fifth location near the high-traffic Vegas strip. "If you have a proven idea, the costs of opening a business right now are really inexpensive," she says. "Commercial real estate has tanked. Now is a hell of a time to get in on a good commercial location." But it's not just the cheap rent that makes Jenkins confident in expanding her business. "As an entrepreneur, Vegas is a great place to start a business," she says. "The community appreciates locals and they've supported me immensely. From what I've seen, Vegas is like a giant small town." "Portland and Oregon are the only places I've seen where constituency groups that normally fight come together," says Gerry Langeler of Portland's OVP Venture Partners. "They've decided that the Oregon Entrepreneurs Network is the engine where entrepreneurs can go for guidance, training, networking and being introduced to venture capitalists. We just decided that the town is too small to have competing ventures." That kind of cooperation is a boon in a city that doesn't draw the type of capital investments found in Silicon Valley or Seattle. 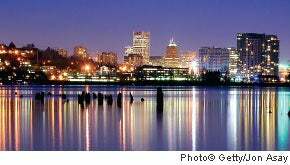 But Portland has made do with the great resources it does have, creating vibrant electronics, clean-tech, health sciences and apparel sectors, and one of the largest and most innovative open source software communities in the world. Plus, the quality of life--Portland is a perennial favorite on most livable and most sustainable cities lists--means a high retention rate for workers. There's only one downside: Portland may be too genial. "For good or ill, the collaborative mind-set tends to diffuse that killer instinct," says Langler. "We don't have too many people obsessed with dominating the world market." 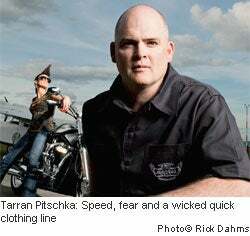 The idea for Tarran Pitschka's clothing line came to him as he stood between two funny cars at the starting line of the Pomona Speedway. "It was pure exhilaration. There were 80,000 screaming fans, and the cars were so loud, I thought my teeth would rattle out of my head," he says. "That's when it hit me: I needed to make a clothing brand based on the human fascination with speed and fear." A few years later, his Wicked Quick clothing line is now available in Nordstrom, Metropark and select Harley Davidson dealers around the country, and has shown up on the backs of stars such as John Cusack. The former Nike and No Fear designer views Portland as a big part of that success. "This is one of the central spots in the world to draw on talent for the apparel business," Pitschka says. "There's so much more optimism and possibility here. There's no reason to be anywhere else." Wicked Quick, which employs 11 full-time employees and contract designers, has seen rapid growth: Pitschka predicts the American-made brand will reach $50 million in five years with the introduction of watches, sunglasses and a Wicked Quick energy drink. Part of that expansion, he hopes, will be financed by local angel groups that have heard his pitches. But even if his company hits it big, Pitschka doesn't anticipate bailing on his city. "There are so many creative people, I can get anything I want designed or made," he says. "Maybe it was chance, or maybe being here was meant to be." Orlando may be the house the mouse built, but a long stretch of intergovernmental and private cooperation is what turned the city into one of the most highly coordinated entrepreneurial engines in the country. The area sidestepped the development turf wars that often hobble other metro areas, instead relying on a strategy of enthusiastic cooperation to power growth. A lot of the heavy lifting is done by the Disney Entrepreneur Center, a one-stop shop where government and private agencies mentor budding small-business owners and direct them to the right resources. Over the next five years, Orlando is scheduled to pump $1 billion into its downtown, an endeavor that's going to need many hands to feed it. But the city is ready for the challenge. "Our first ace is that we have civic leadership that is entrepreneurially supportive," says Jerry Ross, executive director of the Entrepreneur Center. "We have a digital media cluster starting downtown, a medical city that is taking shape--we're part of a high-tech corridor. We're not recruiting companies from out of state. We're engaged in economic gardening: We want to carefully grow what we already have." Catherine Ojeda was working in the accounting department of a timeshare company and operating a pedicab on the side when she realized that riding the three-wheeled bike was a lot more fun than sitting inside crunching numbers all day. 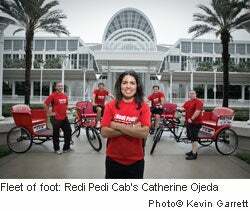 So in 2006, she invested in three pedicabs, contracted two drivers, and began offering rides on the grounds of Orlando's Orange County Convention Center (the country's second largest) and to surrounding hotels. "We give pedicab rides, but really we're a marketing company," says Ojeda, who now owns six pedicabs and contracts up to 10 drivers per event, even traveling to Jacksonville Jaguars games for special promotions. "People hire us to get their product out there; we put signage on our bikes and hand out promotional items," she says. "But most of our drivers give visitors word-of-mouth recommendations, which is very important." In the next year, Ojeda plans to buy more pedicabs and eventually wants a fleet for the popular International Drive district as well as a group of traveling cabs for special events. 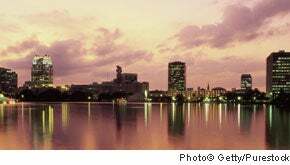 Orlando was the perfect spot for a novice entrepreneur to get her feet wet. "In the beginning, I didn't even have a computer. I had to use Excel at the business center," Ojeda says. "There are great small business resources here and a real community of small-business owners. If I run into hiccups, I can depend on other business owners to support me." When the military started downsizing its bases in the San Diego area two decades ago, the city knew its main economic pillar was crumbling. But instead of bracing itself for the economic impact, San Diego decided to do something about it. The city invested heavily in the idea of technology transfer between the region's high-caliber research labs, like the Scripps Research Institute, and its entrepreneurial community. Today, that idea is paying dividends. 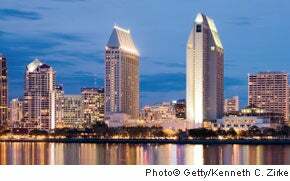 San Diego is flush with startups creating everything from solar panels to gene therapies. Powered by strong biotech, clean-tech and cellular technology clusters, along with its traditional defense contractors, a healthy tourism market and a busy port, the city has transformed itself from a one-trick town into a diverse entrepreneurial market. "When status quo companies hit the wall, a lot of capable people become resources for entrepreneurs," says David Audretsch, an Indiana University economist who has studied the city's transformation. "That's what happened in San Diego. In the wake of that military downsizing emerged a strong entrepreneurial climate." Clean tech is the latest boom in the San Diego scene, with dozens of companies trying to stake their claims in the alternative energy sector by focusing on solar, wind and even algae-based energy sources. But Nicole Kennard is looking elsewhere--to the back alleys of restaurants in particular. 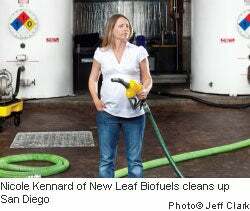 Her company, New Leaf Biofuels, aims to be the biggest provider of biodiesel in San Diego County, a dream that involves trucking tons of used fryer grease from 900 area restaurants to New Leaf's San Diego processing facility and converting it into B99 (99 percent biodiesel fuel), which is then purchased by government and business fleets across the county. "The city is big on getting green business here, and they have a program encouraging clean tech," says Kennard, who snagged a $590,000 loan and some help cutting through the red tape for permits. "They're basically trying to help us in whatever way they can." With diesel prices jumping up and down and lots of her grease providers going under, the last year has been difficult, but her 10 employees and the company's capacity to produce 140,000 gallons of fuel a month make Kennard optimistic that things will work out. "We're still alive, and we feel really fortunate to have made it through these hard times," she says. And there is a light at the end of the tunnel. "There are a lot of renewable energy credits coming from the federal government and lots of encouragement from our local government," Kennard says. "We're happy for that." 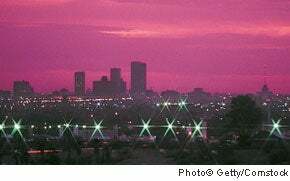 It's hard to pinpoint just one industry that defines the Phoenix metro area. Over the last 20 years, the Valley of the Sun has grown by more than 50 percent, meaning it's had to expand all the basic services needed for a major metropolis, opening huge opportunities for entrepreneurs. With generous loan and grant programs for newcomers and well-developed institutions like Arizona State University's Spirit of Enterprise Center, it's a great place for small-business owners to get started. But don't be surprised if a signature industry emerges over the next decade--a nascent tech scene and coordinated revitalization efforts downtown are attracting more startups and tech-savvy businesses that are planting the seeds of the city's future. To say the Phoenix entrepreneurial community took an interest in John Shaffer's business is an understatement. When he came up with his idea for a sports surfacing company (think basketball and tennis courts, running tracks and gym floors), he was able to run the business model through Arizona State's off-campus executive entrepreneur program. Then he refined it with the help of ASU's Center for Entrepreneurship and the Phoenix Small Business Development program. After that, he was referred to several local mentors, who helped him work out the details before Rhino Sports went live in 2001. His experience wasn't out of the ordinary, either. 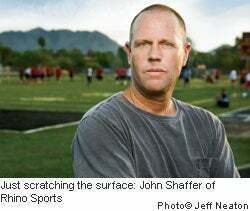 "No business begins and survives, grows, or thrives all by itself," says Shaffer. "One of the nice things about Phoenix is the very strong bond of entrepreneurs who want to help each other, both in formal settings and through their businesses." But there is a flip side: Shaffer, who worked for several years in New York, sees Phoenix as a more competitive and fast-paced market than other towns he has worked in. "People think we're totally laid back because we live in the sunshine," he says. "The business atmosphere is casual, but you have to be quick to the punch. It's like the Midwestern mentality sped up. This place has a cadence all its own." It has no international port, no airline hub and no world trade center, but that hasn't kept Chapel Hill from becoming one of the United States' most worldly cities. Chapel Hill's entrepreneurial forte is building companies that are globally faceted, with businesses taking advantage of the region's increasing connections to India, China and the Persian Gulf. "I was in Vienna watching the Lipizzaner Stallions, and I asked the Ukrainian woman next to me why she was there," says Ted Zoller, director of the University of North Carolina's Center for Entrepreneurial Studies. "She told me she was in town training with Quintiles, a bioinformatics company. I was flabbergasted; that's a Chapel Hill startup. That was one of those real flat-earth moments you get here." But the global ascendancy of North Carolina is no fluke. It was 50 years ago this year that the state dreamed up the Research Triangle Park, the most famous brains-to-boardrooms facilitator in the world. After so many decades, it's providing exponential dividends for Chapel Hill, whose educated work force, established startup culture and resources, and quality of life mean that the whole world is watching to see what it will do next. Outsourcing is a boon for the international conglomerates that can afford it, but sending tasks like custom software creation overseas is a hassle for small and midsize businesses. That's where Spectra Force comes in, providing simplified outsourcing for the little guys. The startup began as a business plan for Amit Singh's MBA at UNC-Chapel Hill, in particular as part of two intensive six-week programs called Discovery and Softlaunch. At the end of those classes, Singh had a workable and well-vetted business plan. "All of the plans were looked at, and mine was judged the best," remembers Singh. "That gave me the confidence to quit my job and work on this business full time." 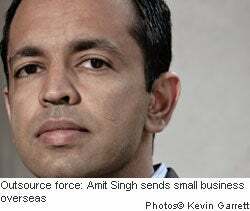 Though he bootstrapped Spectra Force, which now employs 350 people in nearby Raleigh, in Mexico and in India, he still looks to Chapel Hill for guidance. "For me, I wouldn't have thought about starting a business without having the great individuals who've helped me," he says. The area's large pool of highly educated employees and low cost of living did their part too. "If I need advice or help with decision making in my business, I have people I can go back to. There are strong reasons why I'm still part of this community." There's a simple formula that defines the Atlanta small-business scene: Big growth equals big opportunities. Service and retail businesses are in constant demand all across the metro area to serve the city's expanding boundaries, and a full portfolio of city-backed loans, grants and tax credits, combined with a low cost of living, makes Atlanta prime real estate for entrepreneurs with franchise dreams. But this city on steroids is interested in attracting startups beyond the usual chain restaurants and dry cleaners. 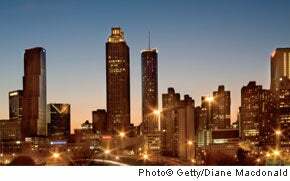 It's pushing hard to develop a biotech cluster in what it's calling the Innovation Crescent, an urban arc from Atlanta to Athens dedicated to life-sciences companies. "Biotech is looking more and more at coming to Atlanta because of what we offer and our quality of life," says Lonnie Saboor, manager of small business and industrial finance for the Atlanta Development Authority. "In five to seven years, we're looking to biotech as a mainstay of job creation and development." It was a visit to the dermatologist that convinced Russell Rainey he needed a new direction in his career path. The former electronics R&D man had been sewing intimate apparel for several years, but foreign competition was forcing his margins lower and lower. 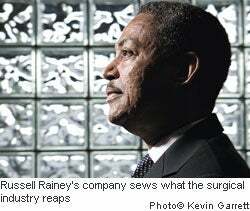 Then a complaint by his dermatologist about the lack of quality post-surgical garments sparked Rainey's imagination. After several years of research, he developed a line of nylon compression garments designed to promote healing after face-lifts, tummy tucks and other cosmetic procedures. The idea took off, and Rainey moved his industrial sewing machine from his home to a facility in central Atlanta, where he now employs 12 people. But his rapid growth didn't happen in a vacuum: SBA development loans and a program called E-200, a mentoring and networking plan designed to help inner-city CEOs take their businesses to the next level, gave Rainey the technical expertise to raise his business from a quarter million to a half million and now over $1 million in sales. Rainey, who hopes to fill the unused portion of the 50,000-square-foot facility that he has dubbed the "Entrepreneurium" with other local small businesses, thinks much of his success belongs to Atlanta. "This is a young, vibrant city. People are more accepting of new ideas than in other places and they want to actually see you succeed," Rainey says. "I talk to people I know in business, and they all say the same thing: If you can't make it in Atlanta, it's going to be hard to make it anywhere." Madison's economy has traditionally been built on the three-legged milking stool of state government, the University of Wisconsin and agriculture. These days you can add a few extra legs for good measure, including biotech, gaming, medicine and software. "It certainly hasn't been by accident," says Matthew Mikolajewski, manager of the city's office of business resources. "It has taken lots of concerted effort to grow that entrepreneurial spirit." That includes a renewed focus on entrepreneurship by the University's business school, the establishment of a fast-growing University research park, half a dozen business and arts incubators, and plans for a new food science lab and incubator developed with the Environmental Protection Agency. 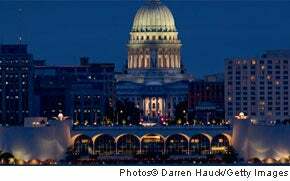 The fact that Madison has the second most educated work force in the country and one of the best quality of life ratings makes it attractive to business owners of all stripes. "If you walk through one of our incubators, you'll find everything," Mikolajewski says. "You'll find a software engineer right next to someone making crackers." With the country's largest outdoor farmer's market and hundreds of organic farms on its outskirts, Madison is the hub of the locally grown agriculture scene. So Heather Hilleren was baffled when each year the natural grocery store where she worked was stocking less and less local produce when demand was skyrocketing. "That's when I realized it all depended on the person doing the ordering," she says. "It would take them five minutes to go online and order produce from a regional distributor. To order locally, they'd have to get the price sheets and spread them out on the table and call each farmer individually. It was an all-day process." 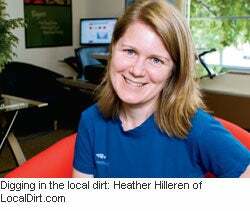 That prompted her to begin working on a quintessentially Madison project that combines high tech with community spirit: Hilleren's LocalDirt.com is a subscription-based web application dedicated to connecting local farmers with grocery stores, restaurants, schools, hospitals and the public. But getting local food on the web took a lot of cooperation. Besides getting grants from the National Science Foundation and support from the UW Extension's Agricultural Innovation Center and local development group, Hilleren took on the challenge to educate farmers around the state about the new service. With two part-time and three full-time staffers as well as contract workers on board, Hilleren recently went national with her site. She hopes the business will expand quickly, but her motivation still reflects the Madison ethos. "I want as much local food sold as possible,"?she says. "I want to give these farmers as much opportunity as possible." Sure, Youngstown may not have the economic firepower of other cities on this list, but it has one important commodity in spades: hope. This rust belt burnout hit the skids in the late '70s and early '80s when the steel industry packed it in, cutting 30,000 jobs and leaving the town synonymous with hard times (listen to Bruce Springsteen's "Youngstown" for details). But in the last decade, something special has happened in this northeast Ohio city. Jim Cossler and his innovative Youngstown Business Incubator, which offers fledgling B2B software companies mentors, networking and services like office space and bandwidth for free or at a deferred cost, are taking Youngstown's business future into their own hands. The incubator concept was revolutionary enough to help ignite a renaissance in this small city. "Youngstown fell so far, traditional community leaders threw up their hands and told the younger generation, 'You guys try,'" Cossler says. "The new generation is envisioning things we wouldn't have talked about 10 years ago." Cossler points to the work of the area's dynamic congressman and energetic young mayor as examples. "They said, 'Let's clean the slate and start over again,'" he says. "There's a radical transformation going on here right now." You wouldn't expect one of the seven fastest growing tech companies in the country to be located in Youngstown, but founder Mike Broderick thinks it makes perfect sense. "I've found Youngstown to be a brilliant place for a startup," says the area native, whose 134-employee Turning Technologies, which makes the audience response systems used in college lectures, corporate events and even game shows, launched in 2001. "I believe in most places we wouldn't have been able to expand with the speed we did," Broderick says. "The affordability here really helped fuel our growth." 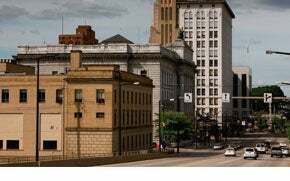 Youngstown's lower-than-average rent and taxes mean dollars stretch further than they would in Silicon Valley. Turning Technologies' early growth--fast-tracked by the Youngstown Business Incubator, which nurtured the company until it spun off into its current facility--meant startup costs were minimal. What's more, because he's based in Youngstown, Broderick has outsized clout. "In most markets, I'd just be running another small company," he says. "But here, I can dial the congressman or mayor when I'm having problems and they'll take my call. That gives you the ability to accomplish a lot of things." "What you have to realize about Austin is that it's a city of scenes," explains Bijoy Goswami, founder of the in-person and online community Bootstrap Austin, and Austin's entrepreneurial culture guru. "We have a music scene, a food scene, a film scene, a tech scene. Recently we've gotten to critical mass with an entrepreneur scene, and there are a lot of things going on." What's happening is a commingling of creatives facilitated by events like High Tech Happy Hour where participants share their new ideas, Rise Austin seminars where experienced entrepreneurs share their journeys, and the popular South by Southwest Interactive conference. All of that is bolstered by a strong slate of resources like the Tech Ranch and Capital Factory incubators, as well as traditional and boutique VC firms and angel networks. "Theoretically, people here are competing, but the opposite is happening," Goswami says. "Part of that Texas ethos has percolated into the entrepreneur scene: People in Austin just treat each other well." 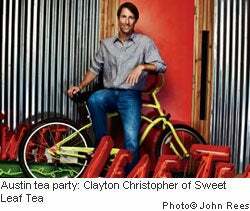 Back in 1998, when Sweet Leaf Tea co-founder Clayton Christopher started bottling tea based on his grandmother's recipe, he didn't realize a big part of what he was selling in each drink was his hometown. "There's a cachet attached to Austin. It's the live-music capital of the world; it has good Texas values," he says. "Having Austin on our bottles has been a huge benefit." Living and working in Austin hasn't been too bad either. Being part of an emerging artisanal and local food and beverage scene that has sprung up around the Whole Foods headquarters in town has led to distribution and networking opportunities. It's a benefit that helped lead Christopher to a recent $15.6 million investment and a distribution deal with Nestlé that will likely increase sales by 100 percent and make Sweet Leaf a household name. But hitting the jackpot won't change things at headquarters, where employees wear shorts and flip-flops and people bring their dogs to work. "We have an extremely strong culture at Sweet Leaf, and it's part of the Austin culture," Christopher says. "We're devoted to our passion and not chasing the dollar. 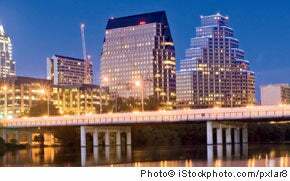 That's something that resonates with Austinites."